Hao-Chun Lai (Mike) – 25, was born in Ilan, Taiwan and is currently a graduate student at Shih-Chien University (USC), Department of Industrial Design. Po-Hsun Lee (Johnny) – 24, lives in Taipei, Taiwan and is currently a graduate student at National Chiao Tung University (NCTU), Institute of Applied Art. Jhih-Yuan Wu (Joe) -27, was born in Tainan in 1988, graduated from Southern Taiwan University of Science and Technology, Department of Creative Product Design, and is currently work as a designer in Taipei. We’re three young men who have great passion for transportation design. Africa – an underserved land needs help and improvements. But as we know, the individual income of the countries in Africa are not so pretty and most Africans are poor, they can’t even afford food not to mention a vehicle. 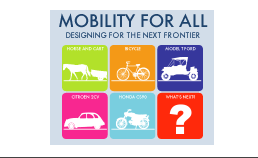 Since it’s unlikely that everyone or every family in Africa can afford a vehicle, we’ve come up with the idea of “Service Mobility”. We chose medical service as the main shaft because we think the medical environment in Africa needs to be improved the most. If it is too difficult for people to get medical help, then let medical help come to them, that’s how we want it to work. M – Clinic, the “M” here means mobile. 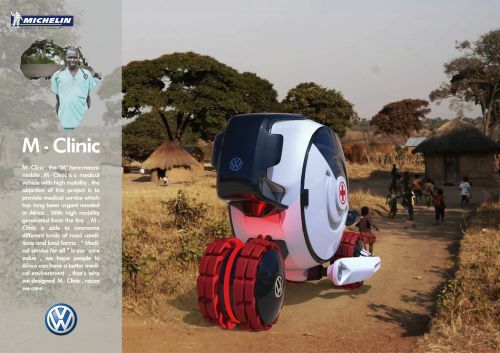 M – Clinic is a medical vehicle with high mobility, the objective of this project is to provide medical service which has long been urgent needed in Africa. With high mobility generated from the tire, M – Clinic is able to overcome different kinds of road conditions and land forms. 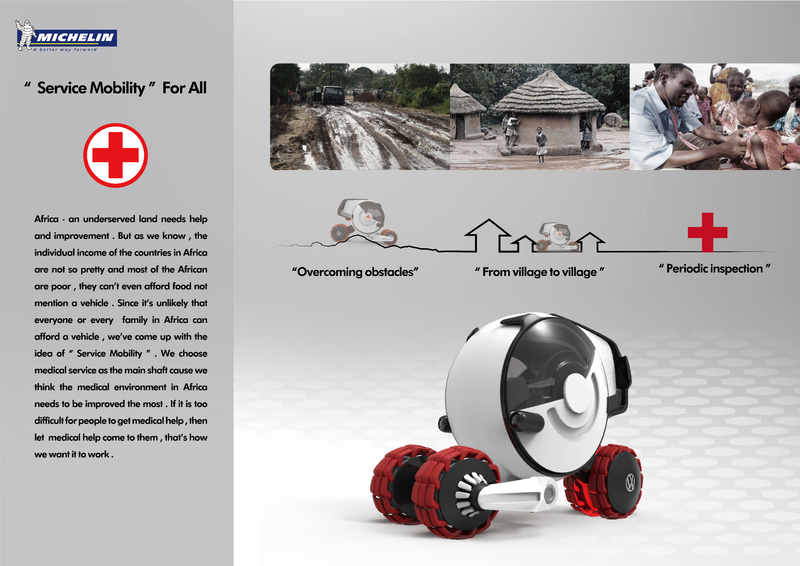 “Medical service for all” is our core value, we hope people in Africa can have a better medical environment, that’s why we designed M – Clinic. 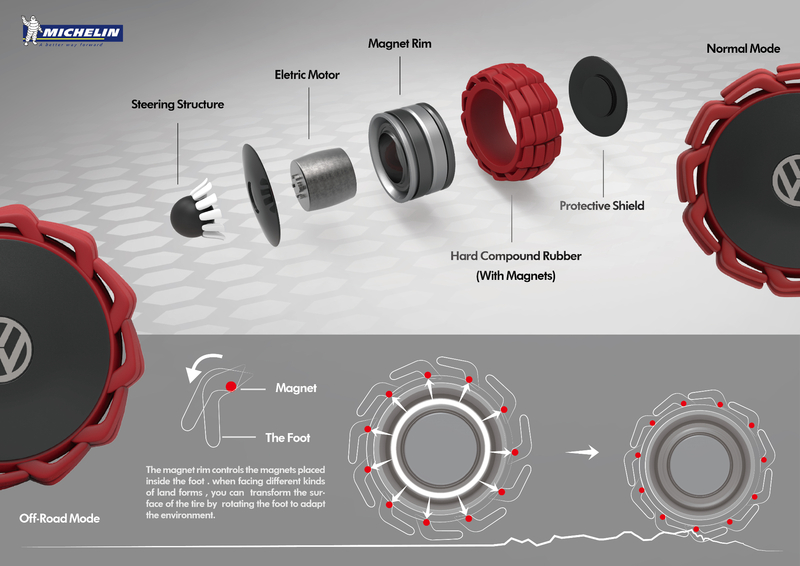 About the wheel, the magnet rim controls the magnets placed inside the foot. When facing different kinds of land forms, you can transform the surface of the tire by rotating the foot to adapt the environment. 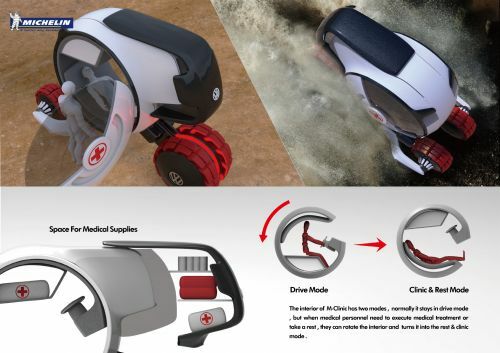 The interior of M-Clinic has two modes, normally it stays in drive mode, but when medical personnel need to execute medical treatment or take a rest, they can rotate the interior and turns it into the rest & clinic mode.